If you're surprised I'm doing a post on a pocket schedule, I am too. But this is possibly the coolest pocket schedule I've ever seen. It looks like an 08 Topps card! Pretty awesome, right? I found this on eBay and clicked Buy It Now right away. Sure I could have waited a few days and saved 50 cents but that's no fun. I don't like the Historical Stitches manufactured patches anywhere close to how much I like the Retired Numbers ones. 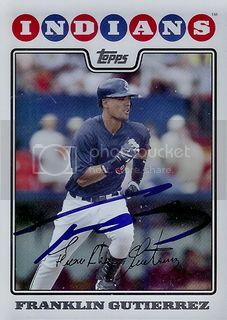 As I mentioned earlier today, Topps left Lil Luis off that checklist. 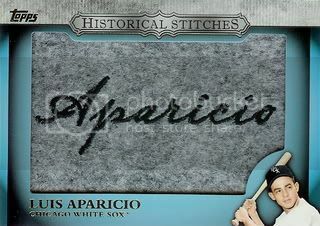 I'm stuck with this weird, fake flannel Aparicio card. I know these are kind of old news by now but as far as manufactured patches go, I really like these. 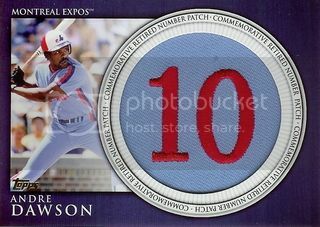 In another life, I had a humble Andre Dawson autograph collection going. 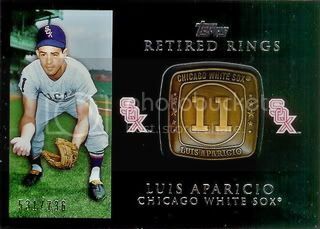 Since Topps left Luis Aparicio off the checklist for these, I grabbed the next best thing. 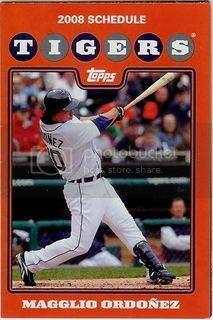 I haven't done too much research on 2012 Topps Tribute. All I know is that there seem to be a ton of different versions and all of the cards come encased. 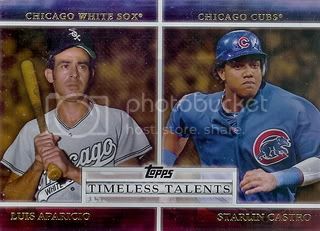 I doubt I'll pick up the entire rainbow for Daniel Hudson or Luis Aparicio but I want to get at least one of each. 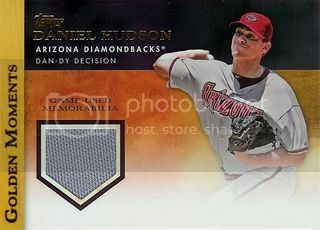 Here's my first Daniel Hudson. It's the one with the photo of more of his full body. The other is more closer up. 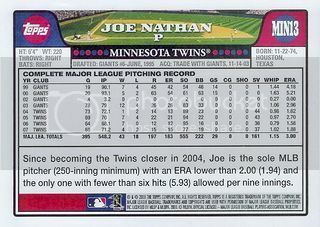 This one's the most common of the parallels and is numbered to 99. 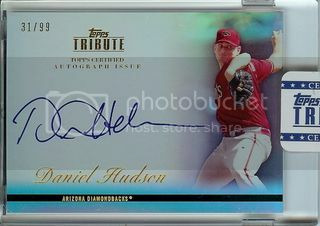 I finally grabbed Daniel Hudson's auto from the 2009 Bowman Sterling set. I have had my eye on this one for awhile. I think it might be his first certified card from a major brand. I had a few nice days over at the Rangers camp this year. I ended up with a few new Josh Hamilton autographs. 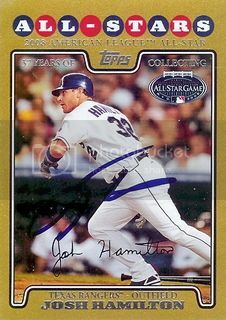 This one is the gold border parallel version of his All-Star card from the Updates & Highlights set. Joe Nathan is now the closer for the Texas Rangers. He had a rough season in Minnesota last year. Hopefully he bounces back to the dominant closer he was a few years ago. We already had his two base cards from the 2008 Topps set signed so this time we went for this one from the Twins 14 card team set. 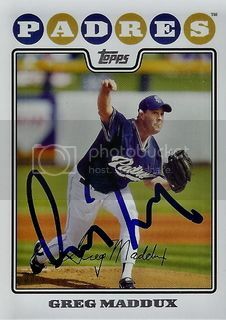 The other day over at Rockies camp, I scored an autograph from Jamie Moyer. As Jamie was walking towards me, I initially thought he was a coach. I guess that occasionally happens to players who are still playing at 49. 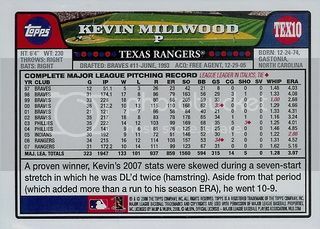 You asked for more Kevin Millwood, so here's more Kevin Millwood! 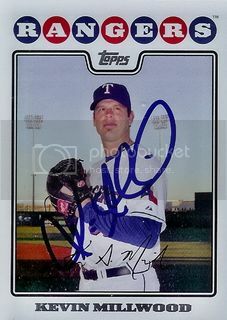 Just kidding, no one actually asked but here's a nice card from the Rangers 14 card team set. Same picture as Kevin's base card on the front but a different back. Former Dodgers closer, Takashi Saito is now with the Diamondbacks. We got him to sign a card from the 2008 Topps Dodgers 55 card team gift set. 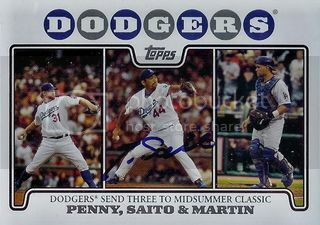 This one's a multi-player card featuring the Dodgers that were All-Stars in 2007. I picked up my first card from the 2012 Topps Gold Rush set that was available from the pack redemption program they set up. It's of Daniel Hudson. Big surprise there, right? These cards are pretty cool. The gold foil embosses most of the card and looks even better in person than the scan. I may have only gotten five new 08 Topps base cards signed in person this Spring Training but I did walk away with a stack of other 08 Topps stuff. One of the highlights is this Franklin Gutierrez card from the Cleveland Indians 14 card team set. Woo! Gold foil! One of the most boring parallels ever! 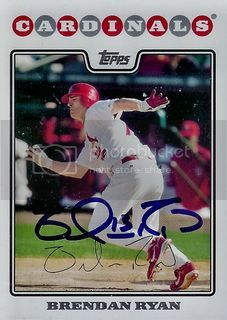 That being said, I'm still glad to have a different 08 Topps card signed for our collection. Thanks, Kevin! 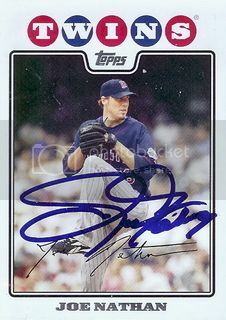 Hands down this is my favorite card I was able to get signed this Spring Training. I know there's still a few weeks left and I have plans to go to at least another game or two. This will still be my favorite card. I had a pretty rough day at the Rockies camp but getting Troy Tulowitzki to sign a card for our set more than made up for the small quantity of autographs I went home with. This is the first time I had ever gotten him so it was pretty cool. 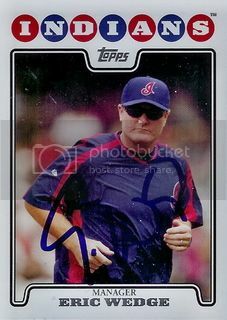 After spending some time in Cleveland, Eric Wedge is now the manager for the Seattle Mariners. From what it sounds like the players really like him. Maybe he can turn things around in Seattle. They've had a rough few years. I had never met Brendan Ryan before until this year. I must say he's a very nice guy. Every time I saw the Mariners he signed for everyone there. He also was very talkative, especially with the younger fans. Carlos Guillen started off Spring Training with the Mariners until he decided to retire last week. Glad we were able to get this one done before he made that decision. Carlos had a pretty nice career going until injuries slowed him down. He was a three-time all-star. Another nice one we got signed over at a Spring Training practice in Surprise. 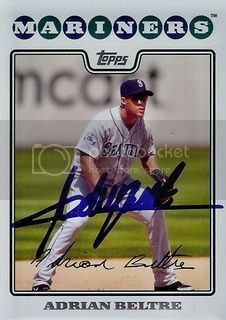 Two-time All-Star, Adrian Beltre signed his 08 Topps card for our set. After a great season in Texas last year, Adrian has reestablished himself as one of the best third basemen in the game and arguably the best player on the Rangers. I stole that idea from the MLB Network's Top 100 Right Now show. They had him ranked above Josh Hamilton, Ian Kinsler, and Nelson Cruz. I'm not sure if I would agree. It's close but I'd rather have a healthy Hamilton or Cruz. As we reach the halfway point for our set it's getting harder to add new signed cards. This is especially true for in person successes during Spring Training. The good news is that when we do, it's often a good one. In this case, it's a great one. Greg Maddux is a special instructor over at the Texas Rangers Spring Training camp. He's working with his brother and Rangers pitching coach, Mike Maddux. Greg was always one of my favorite players so I'm super excited that we were able to get him for our set. Has aone else been watching this show? It's a reality show with the guys from Grey Flannel Auctions. They talk about the items they receive for consignment. Stuff like a game used Gale Sayers jersey or a Mickey Mantle autographed baseball. I'd recommend checking it out if you haven't already. New episodes are on tonight starting at 10pm EST on the Velocity Channel. I guess it's a new channel but my cable company carries it. Last week they had a trivia contest on Twitter and I won a $50 credit to their online store. I don't know if they're doing that again but they're worth a follow anyway ( @GF_Auctions ). 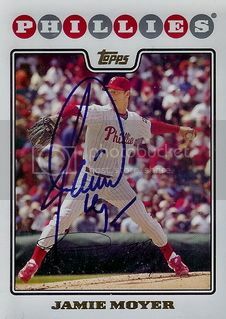 We're kicking off our Spring Training posts with the first and only card we've gotten signed TTM. At least it's the only one so far. Hopefully we still get a few others back. I only sent maybe 40 requests and not all of them were for our 08 Topps set so we'll see. This first one's a good one. 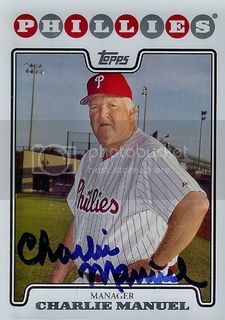 It's of Philadelphia Phillies manager, Charlie Manuel. I probably overpaid for this one but the Retired Rings cards were holding their value for so long I finally cracked and threw down $8 shipped. If you still don't have one of these, they're really nice in person. Super thick and super cool. This is one of my favorite non-auto cards in our Lil Luis collection. I'm glad they included him in this set. 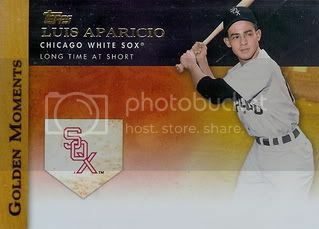 Series one of the 2012 Topps set brought us a few new Luis Aparicio cards for our collection. One of these I bought myself and the other came from Ryan over at The Great Orioles Autograph Project. Both are pretty cool but I like the Golden Moments one best. 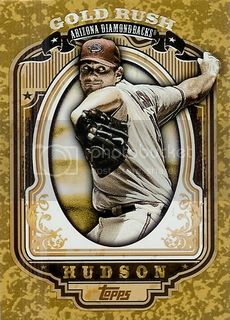 I didn't pick up too many cards from the 2012 Topps set besides the ones I got in the packs I bought but I knew I had to have this Daniel Hudson card. There's a nice spot for an autograph right next to the jersey swatch. I'll have to see what I can do about getting this card signed soon. Before I start posting some of the cards we got signed during Spring Training, I have a few other things I need to catch up on first. 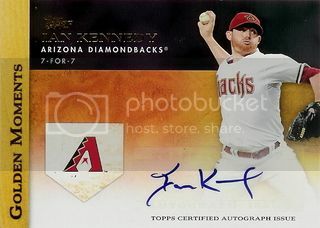 We picked up our first Ian Kennedy certified auto for our D-Backs collection. I really like the design on the Golden Moments insert set. Topps left a perfect spot for the autograph stickers.